Optimist Clubs do many good things in the communities where they serve. From youth sports programs to scholarship contests, among other things, individuals are able to find their passion and make a difference by helping children in a purposeful way. However, the true reason to join an Optimist Club is so that you can make friends and acquaintances that share your passions so that together, you can do more. On Saturday, February 21, I attended the first leadership summit of 2015 for Optimist International. Designed for club presidents and members who want to help optimism grow in their communities, it focused on a number of leadership issues like conflict resolution, managing change, stages of leadership and team building. During the team building session, the facilitator asked, why do we need a team? About fifty Optimists looked forward without an answer. I don't know if they were waiting for the presenter to tell them or if they were merely stumped for a reply, but finally, one of the younger attendees, a student and member of the University of California Santa Barbara Optimist Club spoke up to say, "We need a team to accomplish the things that we cannot do ourselves." I think we often forget that. Teams are important for they allow us to accomplish more. Perhaps Gen X, Baby Boomers, and earlier generations don't recognize this because the dynamics of engagement were different as they matured. They grew up with an hierarchical culture that accepted orders whereas the younger generations are used to an open culture where individuals are equally accountable to themselves, the project on which they are working and their fellow-workers. Both models work, and both models have their place; however, I propose that in a civic - social setting, the open team model is the best approach for it allows input at all levels of planning and implementation. It allows goodness to come forward first, last and in-between as team members work together to make things happen in their communities. Optimist Clubs are truly about the team model. By forming committees and task forces, the groups within an Optimist Club conduct many more projects than an individual might conceive of alone. 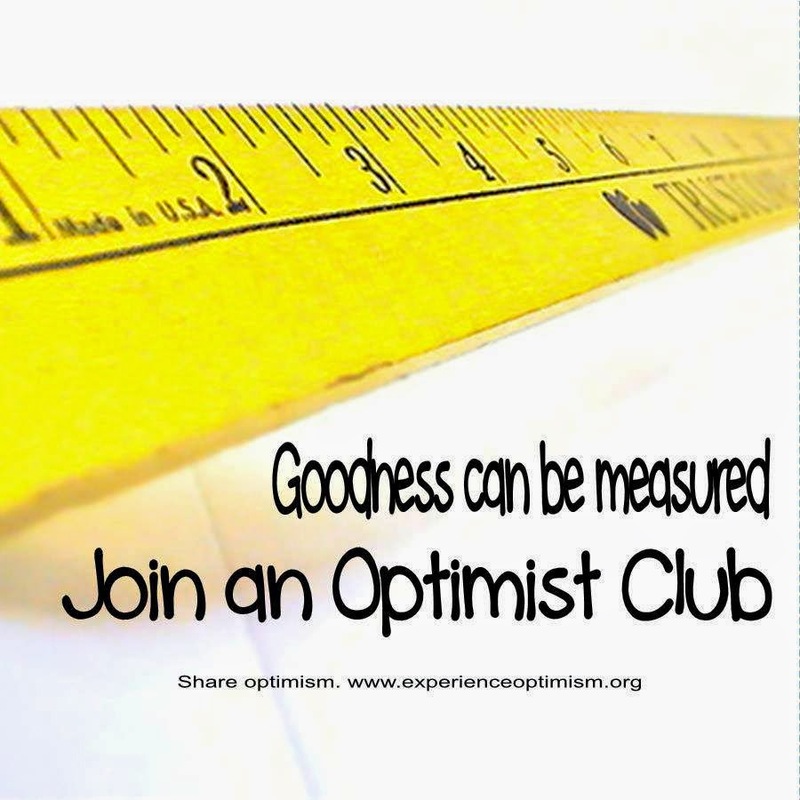 Together they provide a measurable difference and you can too when you join an Optimist Club. Click here to find and join an Optimist Club in your community. If there is not one listed, please contact me and I'll help you start a new Optimist Club to help you spread goodness wherever you live. I typically write and talk about what it means to me to be an Optimist Club member. For me, the value is in the relationships that I create with other adults, my peers who want to do good things in their communities. I'm inspired by the potential that we have to serve. Some are more inspired by the mission of Optimist International which is "With hope and positive vision, Optimist Club members bring out the best in children." Yes, it's true. The children need us to do more than make our communities great places to live. Children need us, adults, to be there for and with them; to create projects and programs that recognize and involve them, and perform activities that make them feel special and worthy. More important, the children need us to roll our sleeves up and get in there and participate right along with them and give them the true feeling that adults do care about them. Optimist Club members do that especially well. It's said that every Optimist Club member personally touches the lives of at least 32 children every year. That might be from a bicycle rodeo, a scholarship contest, a literacy program, or maybe only a donation, among other things, but it is important that adults continue to be involved, in whatever way possible. That's why I implore you to join an Optimist Club. The children really do need you. Click here to find and join an Optimist Club in your community. If there is not one listed, please contact me and I'll help you start a new Optimist Club to serve the children in your city or town. I joined the Optimist Club of Granite City, Illinois in 1987. I've written about it before; I had wanted to join for some time, but it took quite a while for the men in this civic service club to allow women to enter its hallowed halls. Once admitted, I got very involved moving through club leadership to district leadership and eventually landing a job at Optimist International headquarters as the director of membership development. That position led me to visit Idaho and eventually move to the Pacific Northwest District - Optimist International. Once there, I took a hiatus. I never stopped my membership in an Optimist Club; however, my position as the executive director of the Gem County Chamber of Commerce encouraged me to participate in a different community organization, so I did. Service to our community is important, vital and necessary, no matter its flavor of membership and my involvement in the brand K club gave me the opportunity to learn about its inner-workings as I was quickly elected to be the club secretary-treasurer and appointed chairperson of the Key Club at the high school. Fast forward several years when it was time to make a career move. I left the community and the club behind and never looked back because the Optimist family opened its arms, welcoming me on my return. I was happy to be home because the people are different in an Optimist Club. 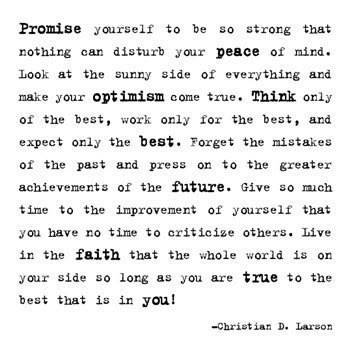 I think it comes from the overarching goodness of the Optimist Creed. When people come together to promise themselves to look at the sunny side of everything and make their optimism come true, you know they are working on their personal development, they want to be good people, as well as doing projects that improve their community. That's important because positive psychology tells us that people with a positive mental attitude are happy and successful. People who are connected to others with strong social bonds are happier still. When you reach out to an Optimist Club, the club members open their heart, and sometimes, literally, their arms, in true warmth and connection. You are welcomed to the family and no matter where you go in life, the Optimist Club family, more than 2,000 clubs strong, is there to welcome and cheer you and above all, inspire you to keep moving forward with your strong family ties. 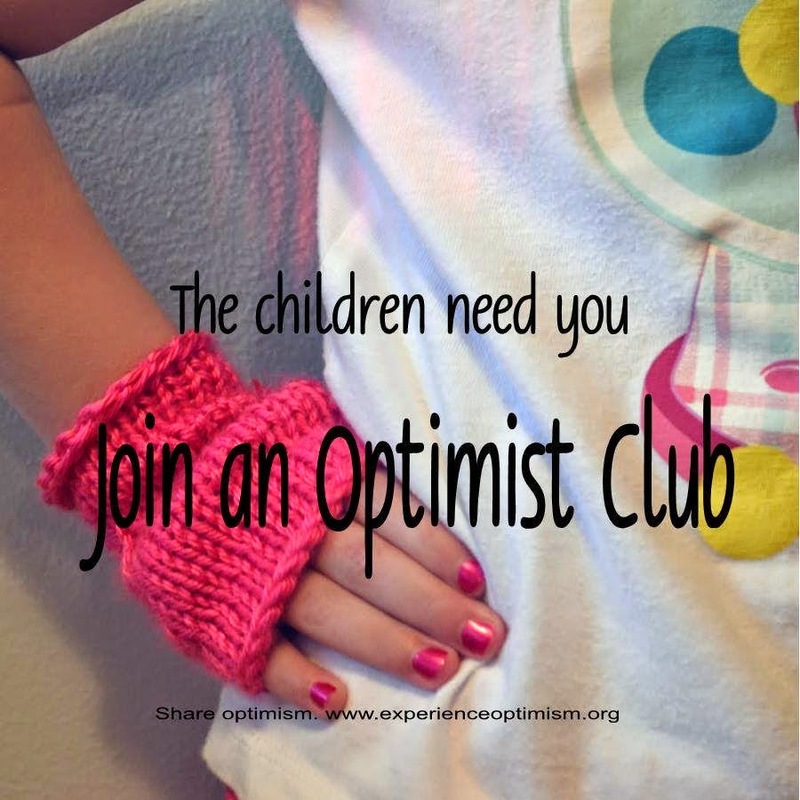 You should become part of the Optimist family. 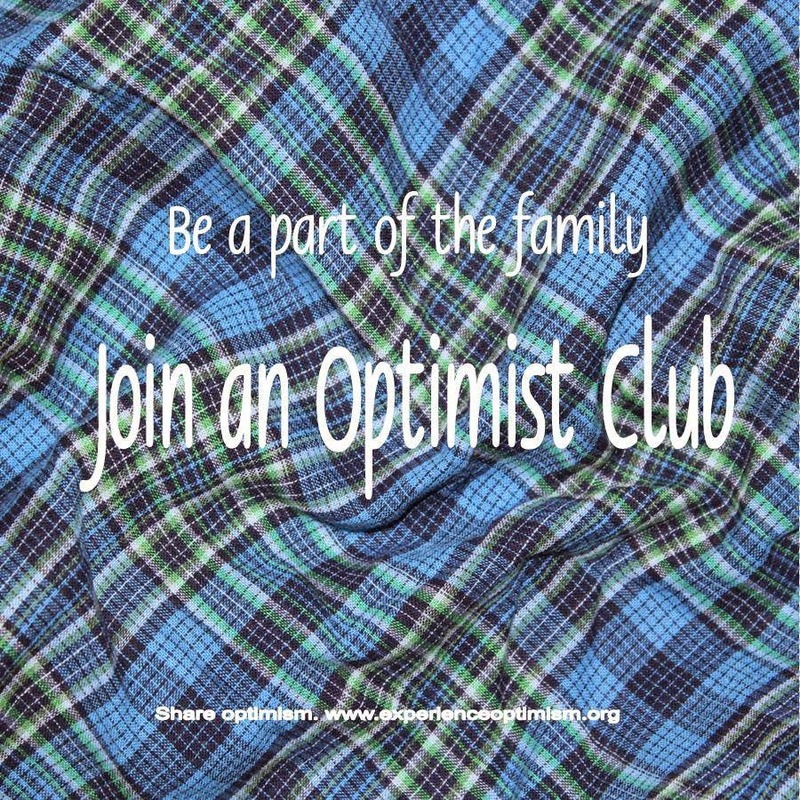 Join an Optimist Club near you or start an Optimist Club family of your own. Please send me a message and I'll help you get one started today.